Today the Liverpool Echo reports that this popular city centre bar has closed unexpectedly. Now only seems to serve Eurofizz and John Lees keg bitter. No real ale available. 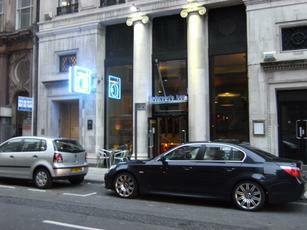 Smart and pricy basement bar with a restaurant upstairs located in the business quarter. Owned by Manchester brewer Lees but sadly both handpumps were out of stock, normally John Willies is on one. There is an abundance of cold mainstream lagers, Guinness and Strongbow, plus shots and cocktails as it�s that kind of place. D�cor is modern with dark wood wainscotting, cream wallpaper with tasteful pictures and mirrors, fancy light fittings and a floor of white tiles and bare boards. Furniture is a mix of sofas, armchairs and tables, and high stools with tall tables. Nondescript punters and background music, staff ok but the wrong side of the bar chatting when I dropped in on this average urban bar. Usual bottled and draught beer. Popular with local office workers after work. An office workers pub. Very popular. Often a cask ale on.